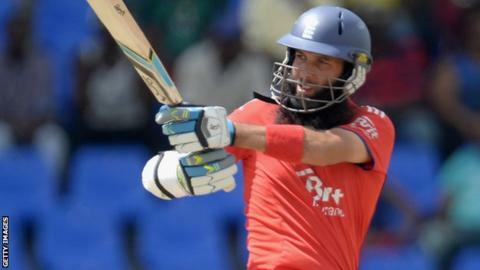 Worcestershire batsman Moeen Ali can establish himself in the England team in all forms of the game, according to county captain Daryl Mitchell. Moeen, 26, made his one-day and Twenty20 international debuts this winter during the limited-overs tour of West Indies and played during the World Twenty20 in Bangladesh. "It's no surprise to any of us how well he's done," Mitchell told BBC Sport. In 109 matches Moeen has scored 6,522 runs at an average of 37.69, with a highest score of 250. A useful off-spin bowler, Moeen has claimed 132 wickets at an average of 41, with best bowling figures of 6-29. Moeen was named Player of the Year in 2013 by the Professional Cricketers' Association and was last year's top run scorer in the County Championship, making 1,375 runs in 16 matches at an average of 62.50. "He's more than capable of getting established on all England fronts." Moeen scored 109 runs, with a highest score of 55, and took three wickets during the three-match ODI series in the Caribbean, but could only muster 57 runs in his six T20Is. But after being the top run-scorer in the County Championship last summer, Mitchell is convinced Moeen can establish himself in the one-day sides and break into the England Test team too. "We've known just how good he is for a couple of years now," added Mitchell. "He's played a lot of Division One cricket too, but he looked comfortably the best batsman we saw in action last season. "He now looks every bit an international cricketer. And there's great pride in the club every time he steps out in an England shirt." Moeen, who signed on a five-contract early last season, is available for the County Championship opener against Hampshire, starting on Sunday. The upside for Mitchell and director of cricket Steve Rhodes is that, by the time that they could lose Moeen, potentially for the rest of the summer, they expect Pakistan Test spinner Saeed Ajmal - the county's number one overseas signing - to have arrived. Ajmal is due to return for the county's first home Championship game against Kent, starting on Sunday 13 April which, despite the New Road outfield looking threadbare after the winter floods at Friday's pre-season photocall, is still scheduled to be staged at the county's Worcester headquarters. The retirement of seamer Alan Richardson, who has become Warwickshire's bowling coach after being Worcestershire's leading Championship wicket-taker for the past four summers, and presence of off-spinner Ajmal, such a hit when he first joined Worcestershire in 2011, has prompted suggestions that Worcester may lose its reputation for pitches that favour the fast bowler this summer, in preference to drier, more spin-friendly tracks. "The words 'New Road' and 'dry' don't go very well together," grinned Mitchell. "But we'll just have to see what our groundsman Tim Packwood can produce for us. The ECB are trying to encourage pitches that turn so, if we can do that, it would be great. "Of course we'll miss Alan Richardson. You don't easily replace a guy who's got 50 to 70 wickets over the last four years. But Saeed will take some of the pressure away and there's places up for grabs from the younger lads. "Jack Shantry had a great year in 2013 and Gareth Andrew now has the responsibility of being our senior bowler." Daryl Mitchell made 6,986 runs in 115 first-class matches at an average of 43.53. The main task for Worcestershire's players, however, not just in Championship cricket, but even more so in the T20 Blast and the One-Day Cup later in the summer, is putting on a show for the increased numbers of new fans looking to sample the new facilities at their still evolving, modernised century-old home. "We know we can compete against any team. It's about doing it consistently," said Mitchell. "We won five games last season in the Championship, which is the same as Northants, who were promoted. "We just have to stamp out the heavy defeats we had and pick up draws. "Everyone's a year older and wiser and we can learn from our mistakes." As for Mitchell himself, this summer marks the home-grown 30-year-old Worcestershire-born captain's 10th as a fully-fledged professional cricketer. "It's my 12th pre-season and my 10th year of Championship cricket," he said. "I'm more established than I was when I made my debut in 2005 and it's a proud honour being captain, a job I really enjoy. "But, whether it's my first year, or my 12th, this is still an exciting time and I can't wait to get started against Hampshire at the Rose Bowl on Sunday."